07.31.07 The Maine Scholastic Boys and Girls Champions Cullen Edes and Lily Ann Briggs are representing Maine in two national tournaments. 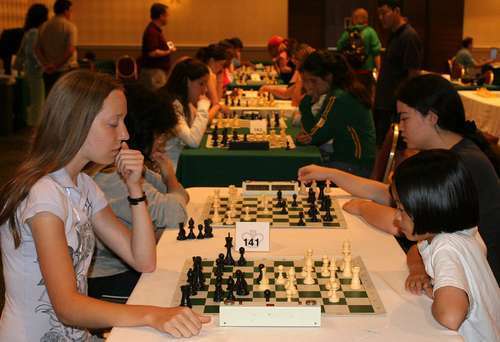 Edes is competing in the Denker Tournament of High School Champions and Briggs in the Susan Polgar National Invitational for Girls. Both of these tournaments are taking place concurrently at the U.S. Open in Cherry Hill, New Jersey from July 29 - August 3, 2007. 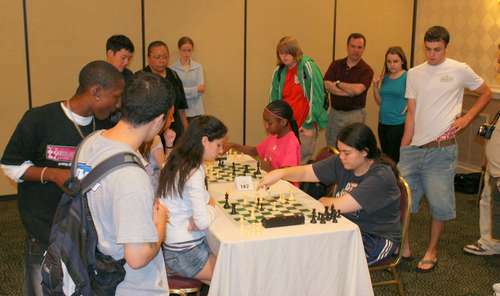 Participants in the 2007 Susan Polgar National Invitational for Girls. Maine's representative, Lily Ann Briggs, can be seen on the far left, just to the right of Susan Polgar. In round one of the Denker Tournament of High School Champions, Maine boys champion Cullen Edes (1708) drew with Massachusetts expert Matthew Klegon (2142). Edes then lost his second round game to Luke Hellwig (1841) of Alabama. Lily Ann Briggs, in her first round game, lost a sixty-eight move duel to the North Carolina girls champion Amelia Wheeless (1725). Abby Marshall (left), two-time winner of the Susan Polgar National Invitational, defending champion of the Susan Polgar Invitational Blitz Championship, scored a perfect 6-0 to win the Polgar Blitz Championship again. Courtney Jamison and Jordana Williams tied for 2nd and 3rd with 4.5 points. Darrian Robinson, Anna Matlin, Eunice Rodriguez, Louisa Livschitz and Amelia Wheeless tied for 4th with 4.0 points. 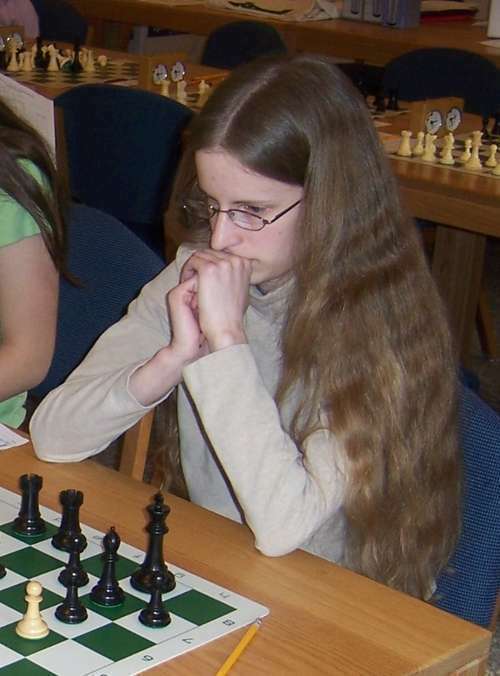 Courtney Jamison (right) on the move in the last round of the blitz tournament, won the 2007 Susan Polgar Invitational Puzzle Solving Championship. She solved all 10 puzzles correctly in about 6.5 minutes. Maine representative Lily Ann Briggs (center in blue against wall) looks on.